COLOR IS A DRAIN ON A PRODUCTIVE SOCIETY. PLEASE WATCH THIS TESTING MEDIA FOR FURTHER EDUCATION. ENJOY YOUR TRAINING! THIS APPLICATION CONTAINS EXTREME FLASHING LIGHTS, VISUAL EFFECTS, AND LOUD NOISES. THOSE WITH EPILEPSY, AND WHO ARE PRONE TO FLASHING SHOULD NOT EXPERIENCE THIS TESTING MEDIA. PLEASE ADJUST YOUR HEADPHONES WISELY. This was a very interesting entry! But oh boy, you nailed the immersion there. Felt really part of an experience, and it was rather well made and believable. It didn't feel pretentious, which is actually not as easy as it seems. It really captured something accurate about "lessons"
Although the gameplay bit wasn't really perfect, it did have interesting visuals. That's how you make something simple looking interesting, by giving it some sort of cohesion and interest when you look at it. The player looked a bit goofy but not enough to find it interesting. That's cool! The story was really interesting, very immersive. The audio was also good if it was just a bit loud at the beginning. It was an overall nice game. There are some things though that bothered me. All that said, i really liked the narrative approach that you took, most games go right to a mechanic. Couldnt get past level 1. If there was some strategy to outwitting the happy faces I didnt figure it out. Sometimes they went away from me and sometimes towards me, not sure why. Graphics in the "gameplay" portion were primitive but cohesive. All in all a pretty unique entry. I would have liked to have seen more but I couldnt figure out how to beat the level. This was an interesting experience. The beginning was really well put together and completely drew me into my brainwashing session. It was really visually interesting and disturbing in a pleasant way! The voice acting was very well done, as well as the rest of the audio and various distortions applied to it. I really like the style! The segments between controlling the character really outshined the gameplay segments, and that's unfortunate. Colliding with walls felt sticky, though maybe that was intended. It could be that I'm misinterpreting the whole gameplay portion. I had no idea what to do on the first level, but... maybe by design? I died a bunch and was then transported to level 2. I did get a chuckle after I figured out how to really solve level 2. Just... listen to the instructions and follow them mindlessly... haha. I nearly quit on level 3 as I thought my character was stuck in the center or something. Also, the text was sometimes a bit too fast, and the text on the white background was especially hard to read. I can't help but get the feeling that maybe I just misunderstood the game(play) slightly? Nonetheless, I think this will definitely be one of the most memorable and visually stunning entries into this jam! Well done! To be completely honest, the gameplay wasn’t really the main focus of this project. the idea was to provide players with a more audio visual experience, so gameplay was more or less a story element. I’m very thankful to hear that the game has been living up to its intended purpose! Thank you for the very long and honest feedback! Dude. Sushi. I am blown away -- this is such a proper experience, and does such an amazing time with the time it takes. So glad I got to stick my name in this, keep embracing this side of your creativity. In the first level, you can walk through one of the walls in the upper left corner of the facility, the collisions between the player and the walls are stopping the player's progress for no reason, some of the lesson's text disappear to quickly, some disappear way too late - I'd make it non-automatic, if you ask me. This game was a hell of a ride. It is so extremely densely packed with weird and abstract content that actually freaking scared me a lot, especially towards the end. You surely know how to build and sustain a certain... atmosphere. I think the length of the game is perfect and I don't want a longer version just to stretch this almost perfect experience. Thank you so much for this abyss that we all stumbled into. Good hecking luck with the submission, Sushi. You deserve the first place. I appreciate the fact that you put the bad stuff first, I guess it can really draw people in if they see that! I actually havent gotten many people who have flat out said they were scared by it. Im really happy that the enviroment and theme worked so well! HOLY CRAP! I'm freaking shaking right now! That literally is not an entry I expected! One criticism is that it's a little bit iffy when it comes to collision with walls. But other than that, immersion was the biggest part of this entry. This game is insanely atmospheric and immersive with its writing, art, and sound design, so great job on that front. Some parts of this are a bit wonky, like the AI in the first two levels. Also, it was pretty difficult finding the exit in the third level because of the lack of guidance. Despite that, this was -- overall -- a pretty great project. This is an insane ride. I am blown away by the quality of this game. This is a good game, full stop. I want to play more of this. My only criticism is that it's too short, but that feels wrong to say because of just how densely visceral the experience was. I want to dig into the GMS file to see how you did this. I am happy to report that my brain is now complete. I will never forget these lessons. As others say, the world building has been implemented to perfection. The game uses it's sound and atmosphere flawlessly to help immerse you into the world, the lackluster gameplay is easily made up for by the execution and presentation of this game. Just a quick warning. Don't play this at full volume lol. This is a very well written feedback! thanks loates! This game's atmosphere is amazing. The use of visual effects and sound effects really helps to shape the game world and tell a story. The gameplay is definitely lacking, but the presentation makes up for it. Highly recommended. I'm not sure if it is intended, but I was able to easily walk through one of the walls and around the level. The game also didn't really lead me anywhere, it was a maze of dead ends. However, it's aesthetic is really well done! 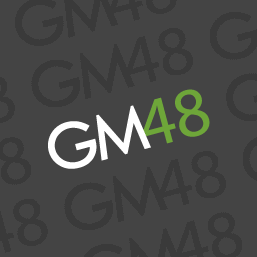 This is my second GM48 entry, my last one being for GM48 "Countdown". At first, I was quite hesitant to participate in this one. My first time doing GM48 was jam-packed up to the bell, and that submission still had its collection of bugs and glitches. The only reason I participated (and even remembered) this GM48 is because I was asked by various members over at the r/GameMaker discord group if I was participating, to which I responded: "Wait... it's today?" After going to the store and grabbing some snacks, I sat down and started working. I actually had a lot of fun making this one. It was really cool to see all the art, sound, and controls come together... something I had never gotten the chance to see with my main project. It got a bit stressful near the end because I wasn't able to fit in all the little story elements I wanted to, but from the ratings and feedback I got, I think the story does well. Most people really liked the story and visuals, and were quite blown away by it! However, the gameplay and stability were where I really kicked the bucket. The collision was a common issue that I heard of, and was actually present in my first GM48 submission as well, and was an issue with the code asset I was using. The game was actually meant to be more of an audio-visual experience, which I succeeded in! THIS MEDIA IS MEANT FOR PRIVATE USE ONLY.